Calgary can have excellent surfing waves and an urban beach at 10th Street Bridge (Louise Bridge) in downtown Calgary. This combination of recreational waves and accessible beach will result in substantial cultural, economic and environmental benefits that will last generations. This project will capture some of global surf tourism which is valued at $50 billion a year. The waves and urban beach are expected to generate $2,200,000 to $6,200,000 per year in new economic activity from wave users alone and generate millions of positive impressions every year from around the world. The waves will have no impact on flood risk or on river levels during a flood. The Alberta River Surfing Association is working with Calgary based Surf Anywhere to develop this project. The project is possible and we are in the stakeholder outreach, support building and initial design phase. In 2018, we completed a detailed Feasibility Study and Concept Design. In 2019, we are completing our initial design that covers all aspects of the project and we will be completing our initials asks of support from municipal, provincial and federal governments. The river conditions at the 10th Street Bridge (Louise Bridge) location allow for world class, adjustable waves all year except for during floods and heavy ice coverage. The wave making structures will collapse flat to the river bottom before and during flood season to completely avoid any effect on river levels during floods. The development will make this section of river safer and more enjoyable for all river users, will improve the river and riverbank ecosystems, will create a vibrant cultural anchor on the west end of downtown and with result in millions every year in additional economic activity. For more information or to support the project contact Neil Egsgard of the Alberta River Surfing Association at President@AlbertaRiverSurfing.com. For more information on Slam Festival, our annual summer surf, art, music and skate festival go to SlamTheFestival.com. Slam Festival showcases our vision of an urban beach at 10th street wave, creates great experiences and builds awareness and support for improving surfing in Alberta. This page is always under development as the project progresses and more details will be added. Who will use the urban surf beach? 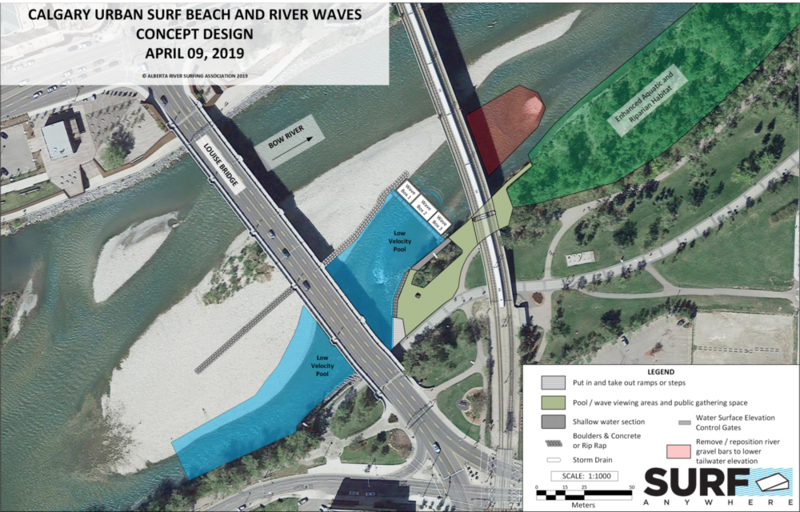 The Urban Surf Beach is designed and planned for all to enjoy and will be used by large sections Calgarians and visitors with hundreds of thousands of visitors & users each year. 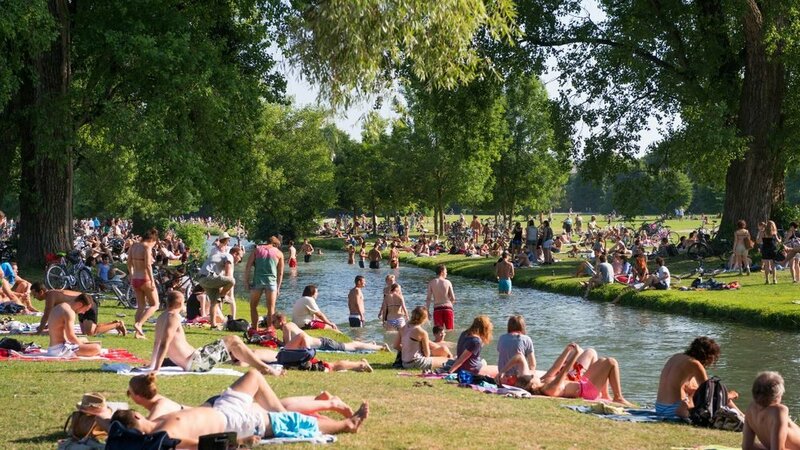 The Urban Surf Beach will be used as a meeting place, as a river access point, as a recreation area, as a classroom, as a research area, as a place to appreciate the river and many other users. The Urban Surf Beach will be enjoyed by youth, adults, elderly, rafters, swimmers, sunbathers, SUPers, paddlers, walkers, waders, environmentalists, anyone who enjoys experiencing the river and, of course, surfers. The area will include accessible access to the riverside for both river entrance and exit. As the first and best river access in downtown Calgary, the area will become a regular take-out and put-in point for Bow River floats and paddles. How will different users benefit from the area? The beautiful look and sound of the waves will provide a great background for people to enjoy the river. The river recreation will create lots of action for people to enjoy while relaxing on the sunny river banks and bridges. The area will be much safer for rafters and floaters and provide easy and safe entrance and exits from the river. The river upstream of the wave will be slow and deep making it easy for unskilled rafters and floaters to paddle to the bank. There will be ramps both upstream and down stream of the wave that allow easy river exit and entrance with small rafts. There will be signage notifying rafters and floaters of the wave and the river exits. Rafters and floaters will be able to avoid the wave by taking the north channel or getting out of the river and walking around. If rafters and floaters go over the wave, they will have a fun ride and may fall out of the raft and will then float downstream. Currently, the area is hazardous for rafters and floaters. Rafters and floaters often get stuck on the boulders where the river turns after the Louise Bridge. Many rafters and floaters take out at this location and have to walk over unstable boulders will lots of holes. The surf community rescues struggling rafters and floaters every year. The area upstream of the wave will be slow moving and deep and will provide a swimming area. Swimmers can go over the waves and will float through the waves and downstream without stopping. The flat and slow moving water upstream of the wave and the access and exit ramps will provide an easy way for paddlers to leave and enter the river. Paddlers will be able to float over the wave and downstream. The riparian habitat improvements downstream of the wave will create a small and accessible natural area. The area will be much better for wildlife. The signage about teh river ecosystem and positive river experiences will create good connections between people and the river and more people with care about protecting our rivers. The Urban Surf Beach will provide an engaging classroom for students to learn about how river works, about river ecosystems, river safety and about the physics of wave formation. The area will also allow for school surf competitions. The summer junior river safety & surf program will provide youth training on river safety, river usage and provide improved river safety for all users. The Urban Surf Beach will allow ongoing research into successful urban beach strategies and different ways to shape river waves. The Urban Surf Beach waves will provide excellent surfing for all levels of surfers and become a major surf tourism destination. Will this project impact flood risk? No, there will be no impact on flood risk or on water levels during high water season. The structures that make the waves completely collapse to the river bottom. When the structures are flattened there is no change to the current river levels. The structures will be flattened well in advance of flood times ensuring they will not impact river levels. 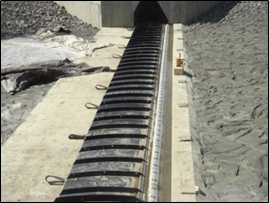 This project can be done as part of flood mitigation projects that will reduce the flood risk. Has this technology been tested in similar rivers? Yes, the technology has been used across the world and functions extremely well in rivers like the Bow with high flows and lots of material being moved down river. How will the waves and beach area handle a major flood? The waves and beach will return to normal operation shortly after the high water recedes. These types of waves have gone through major floods in many different locations and come through with no or minimal problems. Could the river move away from the wave location after a major flood? The Bow river has split at this location for at least the past 100 years. The Bow River has flowed over the wave location for at least the past 100 years. There have been multiple major floods during this time frame. What happens if the wave making structures break? The structures are designed so that if there is a failure then they fully collapse. When the structures are collapsed they do not affect river levels. How will maintenance be handled after a major flood? The Alberta RSA will maintain a substantial fund for maintenance after a major flood event fund. These funds will be used, if needed, after a major flood event to ensure the wave remains operational. The fund will be established during initial construction and increased and replenished through operation of the area by the Alberta RSA. What is are the key technologies? River waves are created by controlling how the water flows from the high point. There are two key technologies involved, a water level controlling technology and a wave creating technology. What is the water level control technology? 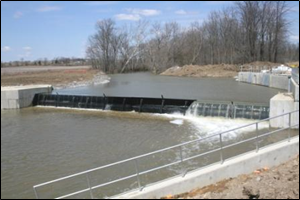 The water level technology controls the water level upstream of the waver and controls which wave(s) get water. This technology also makes it easy for future inspection and maintenance. The water level controlling technology is intended to be Obermeyer Gates or the equivalent. The gates consist of large plates anchored to a concrete foundation. The plates are raised and lowered by large bladders or hydraulics or pneumatics. There will be a way to mechanically and manually raise the gates should there be any equipment problems. What is the wave creating techonology? 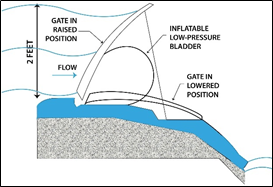 The wave creating technology shapes the flow of water going from the upstream high point to the downstream low point. There area a number of different methods to for creating waves. Our method will involve a highly adjustable river bottom. Some examples of this type of technology are below. The examples include a fixed in-ramp with an adjustable kicker and adjustable in-ramps with adjustable kickers. The Calgary waves project will be using a much more adjustable variation of these technologies. 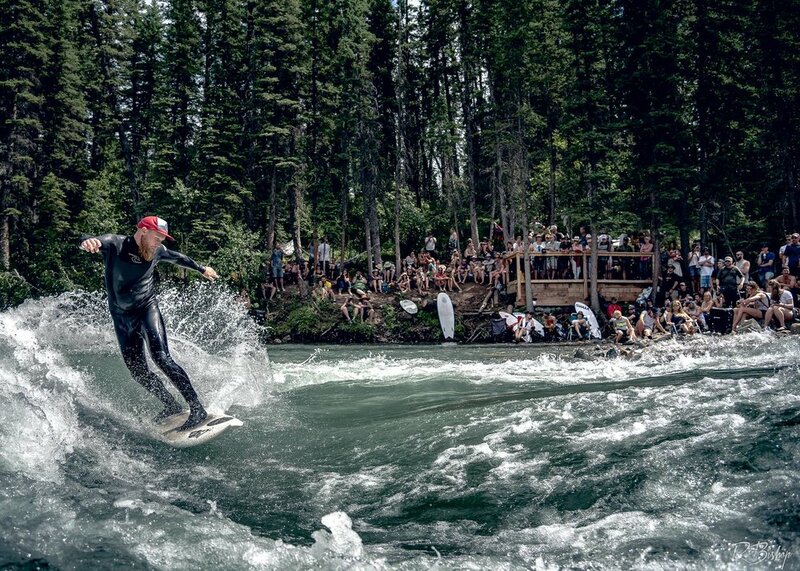 Can good waves be designed and built in the Bow River? Absolutely, good wave design and good construction results in good waves. Good river waves have been built in major rivers all around the world and good waves can be built in the Bow. 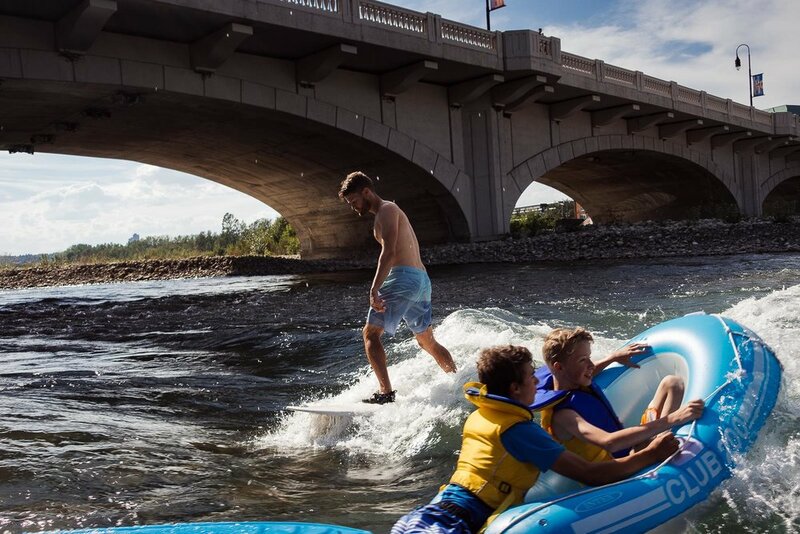 The Alberta RSA is working with Surf Anywhere, a Calgary river wave building company, that has extensive experience building successful river waves in Canada and around the world for over a decade. What will be the size of the waves? There are three wave channels. The channels will be between 10 and 15 meters wide. The channels can be operate to make multiple small waves or one 30m wide wave. The waves can be up to 1.5m high from trough to peak. There will always be two waves operating. Occasionally, at lower flows, there will be one high performance wave. At higher flows, all three waves will be operating. It will be possible to transition from one wave to the next. Will the waves be adjustable? Yes, the waves will be fully adjustable. The waves can be changed to make different shapes of waves and to make the best waves at all flows. Will there be a cost to use the waves or beach? The waves and beach will be public and free to use. This project provides public benefits that will last generations. What types of river users will enjoy the waves? The waves are adjustable allowing for ideal features for all river users that want to ride waves including surfers, SUPers, body boarders, kayakers, body surfers and others. The waves can be smooth green faces for big carves, whitewater holes and other shapes. How often will the waves be usable? The waves will be usable all year except for times of heavy ice coverage. pre-flood days and during floods. Current wave usage in Alberta and other locations shows that the waves will be used whenever they are operating. Has the Alberta River Surfing Association built waves before? Yes, the Alberta River Surfing Association worked with Surf Anywhere to build the world famous Mountain wave in Alberta in 2014. The Mountain wave is made from large boulders, is not adjustable and is the best river surfing wave in Western Canada. The Mountain wave has received very positive local, national and international news coverage. The Alberta RSA is building more waves in the Kananaskis in 2019. Matthew Robertson on The Mountain wave during the first North American River Surfing Championships in 2017. Wave by the Alberta River Surfing Association & Surf Anywhere. Photo by Robert Bishop Photography. What experience does Surf Anywhere have building waves? Surf Anywhere helps surfers and other river users build waves across Alberta, across Canada and around the world. Surf Anywhere projects include the Mountain wave in the Kananaskis and the best manufactured river surfing wave in the world in Bend, Oregon. Surf Anywhere also provides a wide range of other services to improve the river surfing. Surf Anywhere past projects can be viewed on the Surf Anywhere Projects page. Will there be onsite river safety? Yes, the Alberta RSA is developing a river safety program for the Urban Surf Beach. The program will provide trained river safety personnel for the Urban Surf Beach. There will be a junior river safety and surf program for youth each summer that will train young people on river safety, river rescue, river recreation, provide really positive river experiences and develop a healthy culture of river safety and respect. Will the waves be low risk? Yes, the waves will be low risk and much safer than the current river section. The water provides a cushion that reduces or eliminates the impacts of falls. The river section downstream is long and straight allowing users to safely exit the river. Users can only stay on the wave if they are trying to stay on the wave, swimmers and floaters will pass through the wave. There is always some risk to river usage and that will remain. Will there be safety improvements to the existing river section? The river upstream will be slower and deeper, there will be an easy and safe exit for rafters, there will be easier river access and easier river exits. The river passage through this section will be much safer for rafters and other river users. Old metal cables, shards and other old debris will be removed from the area. The waves and beach will be an excellent location to introduce Calgarians to the river and river safety. How will night time usage or usage during dangerous river conditions be managed? The waves are adjustable and can be quickly and completely flattened at anytime. If night time usage is not desired, the waves can disappear every night and reappear every morning. How can rafts and other boats by-pass or float through the wave? The river splits upstream of the wave. The larger portion of the river goes on the north side and completely by-passes the wave. The smaller portion of the river goes towards the wave. There will be a number of spots for floaters to exit the river before the wave. The river before the wave is deep and slow making it easy to exit. Boats can safely float over the wave. There will be signage indicating the different routes and exits. How can police and fire boats by-pass or go through the waves? The police and fire boats can completely by-pass the waves via the north channel which will be unchanged. The waves can be completely flattened allowing the police and fire boats to go over the waves location. Global surf tourism is valued at $50 billion per year. The waves will generate between $2,200,000 to $6,200,000 a year in new economic activity from wave users alone. Alberta has only minimal surf related economic activity and this will be new economic activity. As of 2018, the early budget cost is $7,000,000 including 30% contingency and a fund for maintenance after a major flood. What is the payback on this investment? Payback is expected to be between 2 to 4 years. How will the waves generate millions of dollars each year? The spending is created by waves users and spectators coming to the area. The average surfer spends $62.50 per surf session and makes $75,000 per year. The spending is based on lodgings, food, gas, equipment and other local spending. There will always be at least two operating surf waves at this location. The two waves provide a total of 100,000 two hour long surf sessions from March to November each year. At 35% of possible usage, the annual spending is $2,200,000. At 100% possible usage, the annual spending is $6,200,000. This spending only includes wave user spending and does not include spectator spending. Spending numbers come from major US and UK studies of surfer spending. Why would people choose Calgary for surfing over other locations? The Calgary waves will be predictable, if you plan a vacation a year in advance and spend thousands of dollars you know the waves will be there when you arrive. Wave users and spectators get more time with waves in one day in Calgary then in a month at the ocean because river waves are always working. Calgary offers a huge variety of high quality and accessible other attractions. What competition exists for the waves and urban beach? There is no competition outside of the coasts and the southern United States. The closest good waves are over 1,000 kilometers away on the Pacific ocean. Are there other economic benefits? A 2015 study on housing prices within walking distance of a surf break showed that houses close to a surf break had an increased value of $100,000 (about 10% of the average house value in the study) compared to houses further away from a surf break. There is also increased economic activity due to spectators and events. The money for the project will come through a combination of community fundraising, local donations, local partnerships, corporate donations of goods and services, events, grants and public funds. Well built river waves have very minimal ongoing costs. The design will make the minimal seasonal maintenance very easy to perform. There maybe large costs following major flood events but the Alberta RSA will permanently maintain a large fund to cover these costs. Who will operate the wave? The wave is intended to be operated by the Alberta River Surfing Association. When will the waves and beach be open? The project is at the initial stages as of 2018 and completion would be between 2023 and 2028. The timing depends on funding and approvals. We have completed the feasibility study and concept design and know great waves and an urban beach are possible in this locations. We are preparing a detailed design report to present to the City of Calgary and Province of Alberta and will request full support from both the City of Calgary and the Province of Alberta after the report is delivered. The report will include the results of stakeholder engagement, initial permitting discussions, initial design and more. Here are the general project stages. What level of support for the project? 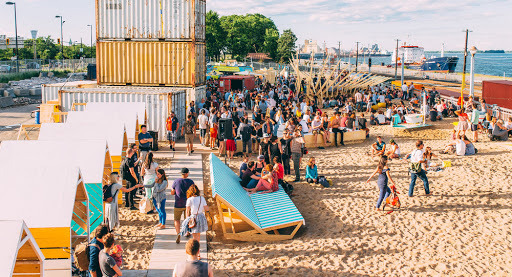 How will the construction of the waves and urban beach benefit the environment? As part of the construction, nearby river habitat and the river bank habitat will be improved. The improvements will make those areas better for the animals and plants that live there and that are there seasonally. The project will be self compensating meaning there will be an increase in good river habitat and river bank habitat as a result of the project. The improvements at the wave will protect the area from further erosion while retaining natural elements of the area. How much habitat will be environmentally improved? Over 960 m2 of in-river habitat will be improved. 7000 m2 of river bank habitat will be improved. How does the the ongoing use of the waves and urban beach benefit the environment? 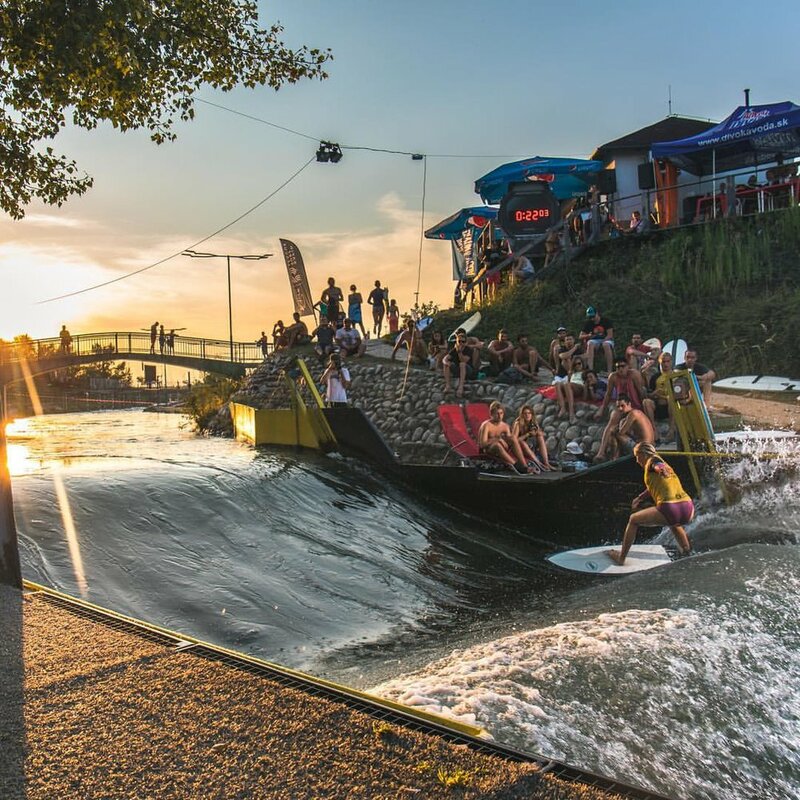 The waves and urban beach will bring a lot of people to the area and create very positive and memorable experiences with the river. The more people are aware about the river and have positive river experiences, the more they will care about protecting river health. The area is also an excellent location to educate people about river ecosystems. Will fish be able to pass the waves and beach? Yes, fish will easily be able to pass the waves and beach. The Bow River splits at this location into two channels, a north channel and a south channel. The two channels have existed here for over 100 years. The north channel has most of the the Bow river flow The north channel will remain untouched and will be able to swim upstream easily. The waves can be flattened making it easy for all fish to swim up south channel. Will an environmental assessment be completed? Yes, the project will include a full environmental assessment. The environmental assessment will be used to help improve the area river (aquatic) and riparian (riverbank) habitat and avoid negative environmental impacts. How will these waves and the urban beach benefit Calgary culture? This project will take a minimally used section of Calgary river front and create a vibrant public gathering space and cultural anchor for most of the year. Good recreational river waves are proven draws for users and spectators and become regularly used spaces for public events. The urban beach will create a low risk space for people to enter, exit, experience and connect with the Bow river. Who can enjoy the urban beach and waves? The urban beach will be usable by everyone. Wave usage is a low impact and low cost recreation. This means the waves can be enjoyed by all ages from children to seniors. Will the area be accessible? Yes, the design of the river bank area will include sloped access between levels to allow for wheeled access such as wheelchairs and strollers. What are the athletic benefits of the waves? The waves provide an excellent training ground for surf and other wave riding athletes. The waves are free to use, very high quality and are available for most of the year. This combination means athletes of all ages can spend many hours improving their skills and entertaining the spectators and beach goers. Wave users could easily start in Calgary and end up representing Canada at the Olympics and other international events. How does the Alberta RSA handle Conflicts of Interest? The volunteer Alberta River Surfing Association Board handles Conflicts of Interest as per our Conflict of Interest policy. This policy was developed with assistance from the Alberta Government. The policy is available here. Additional FAQ sections and information will be added.